The (simplified) formula for distance potential of the golf club striking a golf ball is: M x S2. (For the formulaic challenged, M Mass and S Speed). Thus, the way to hit the ball farther is to increase either the Mass (weight of the club) while maintaining Speed -- or increase the Speed of the swing while maintaining (or close to it) the Mass. Since the formula squares speed, it is far, far easier for most golfers to increase the Speed by making a slight sacrifice in Mass. This is where the Cleveland DST Driver comes in to play. Positioned in the "Sub 300 gram Ultralite" category, the overall mass of the Launcher DST is 25 grams lighter than standard drivers. This was done by using/moving/losing a couple of different areas. In the 460cc clubhead, 9 grams of weight was removed from the face and repositioned lower and deeper in the head to create a deeper CG (Center of Gravity) for a high MOI (Moment Of Inertia). This high MOI allows for less dispersion on off-center hits and thus, straighter drives. 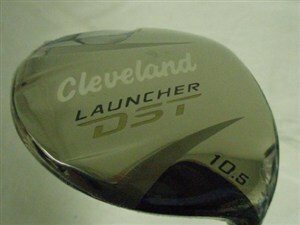 Also in the Launcher DST is Cleveland's MaxCOR face -- a variable face thickness that creates a higher COR (Coefficient of Restitution) on those off-center hits -- thus longer drives (for a more complete description of COR, read my review on the TaylorMade V Steel 3-wood). Taking weight from the overall club, Cleveland uses the Mitsubishi Diamana Red 44 shaft. It's a bit longer than a standard driver shaft at 45.75", but lighter weight at only 44 grams, to allow for that increased swing speed mentioned earlier. And finally, the standard grip is a lightweight 40g offering from Lamkin. Despite a lot of technology, the Cleveland DST driver has a very traditional-looking clubhead that produces a satisfying sound and feel with its square face and neutral weighting. The DST driver is available in both Right and Left hand orientations (9 and 10.5 degrees in LH and 9, 10,5 and 12 degrees in RH). This is a handsome club is the "teardrop" shape that is both aesthetically pleasing and high-performing. Unlike most previous Cleveland clubs, this one has a touch of royal blue paint fill in addition to the usual white/gold Cleveland is known for. It makes a nice offset to the black top-side and brushed chrome finish on the bottom.